Chris’ fascination with all aspects of aviation began at an early age. First experiences of flying and aerobatics were in a de Havilland Chipmunk as an RAF cadet. Some years later he was able to complete his PPL on the Chipmunk and own a share in his own machine. This led to his first taste of display and formation flying as part of Captain Neville’s Flying Circus, involving balloon bursting, flour bombing and flying ‘limbo’ underneath bunting! Aerobatics however was always the special focus and Chris progressed to flying the Pitts Special, the iconic aerobatic biplane flown by almost all the great competition and display pilots at some stage in their careers. In 2006 Chris entered aerobatic competition in the Pitts. 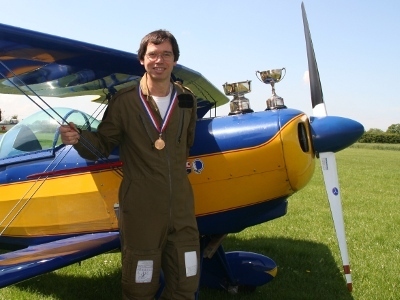 He started the season with a maiden win first time out in both of the first two tiers of aerobatic competition, and ended the season as UK National Aerobatic Champion in the Standard category. Chris’ Pitts Special was a “homebuilt” aeroplane – with scope for some hands-on, “nuts and bolts” engineering. “My Pitts started life with two ailerons, flat-bottom wings and no electric system, and ended its time with me with four ailerons, symmetric wings and full electrics, including a starter motor and an alternator! It was a lovely, responsive aeroplane to fly, though lacking the ultimate performance of the latest monoplanes”. 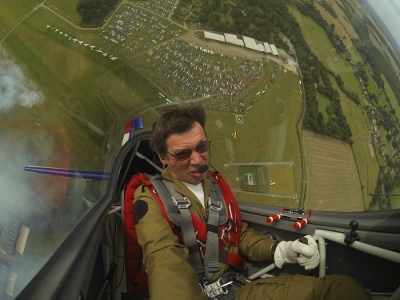 In recent years Chris has been flying advanced aerobatics in the Extra 300S. This is one of the latest breed of powerful, lightweight monoplanes that have opened up previously undreamt of manoeuvres – end-over-end tumbles that leave you thinking “planes are not supposed to be able to do that” and wondering “how on earth did he do that?”. This year has been an exciting one, with displays at major international airshows, firstly in Bahrain and then in China. At the Bahrain airshow he was flying a display for the courier company DHL, which involved flying in formation with one of their Boeing 757’s. In China, Chris was flying as a member of the Global Stars 4-ship display team, helping Skoda to launch a new car onto the Chinese market. Chris has held a CAA Display Authorisation since 2006. This includes advanced aerobatics including all unlimited level gyroscopic manoeuvres, plus formation (including aerobatics with four aircraft), and ‘limbo’ down to 3 feet AGL. Chris has been a member of the British Aerobatic Association for many years, participating as a competitor and serving as a judge and volunteer. Competition flying experience provides excellent discipline and progression through the aerobatic repertoire to the more advanced freestyle maneuvres. He now also offers training to others – a previous student was coached from aerobatic ab initio to a win in his first aerobatic competition. 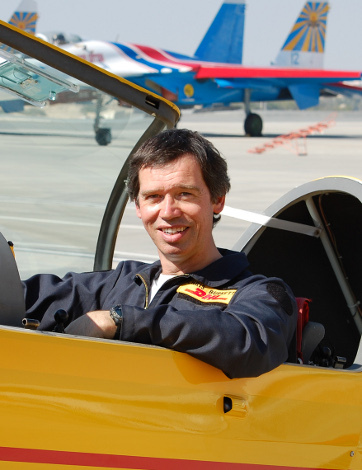 The aerobatic flying activities dovetail well with Chris’ professional training as an aeronautical engineer. This started with a stint at the Royal Aircraft Establishment, assigned to the Tornado flight test programme. Chris was awarded a National Engineering Scholarship and also an undergraduate apprenticeship at British Aerospace Hatfield, leading to First Class honours from the University of Southampton. Chris is a Director and co-founder of Flow Solutions Ltd – specialising in aerodynamic design software and consultancy. Clients include most of the top championship winning Formula One racing teams. In particular this involves designing the racecar wings – this time of course generating high levels of downforce as opposed to lift! Projects also cover a range of industries – traditional aerospace and defence, naval hydrodynamics, America’s Cup yacht racing and speed record challengers, and ‘green energy’ wind and tidal turbines. Unlimited level aerobatics is an intensely demanding activity, mentally and physically. Apart from ‘pulling g’, Chris enjoys tennis, squash, running, climbing, skiing and ski mountaineering to help stay in shape. Chris lives in Bedfordshire, UK, with wife Julia and son David. G-Force Aerobatics are ideally placed to cover your event – whether it be local (south east England), continental (UK and Europe) or worldwide.